The best available room in your category. Size 55,00 m2 with balcony. Room with twin beds (1,10 mt. each one) or 1 king size bed (1,80 mt.) and 1 extra bed (1,10 mt.). Double door and hall. Dressing room. Living room. Complete bathroom, with bath and sauna. 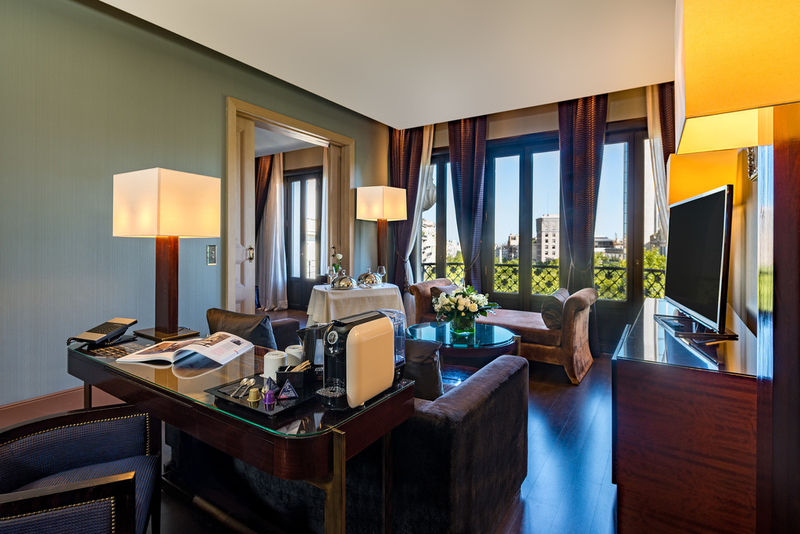 The room is facing to the main avenue Paseo de Gracia. 15% Discount. 30 Day advance purchase promotion. As a Monument Building, Hotel Casa Fuster has the moral obligation to preserve this historic site. With the much awaited approval of the city of Barcelona, we have started the heritage conservation tasks in order to preserve the façade of this iconic hotel, built by the famous architect Lluís Domènech i Montaner. This work will take place by dividing the building into sections, and will only affect the outside of the building. This division will insure the preservation works will be focused on a certain area of the property at one time, so the other areas will remain completely operative and functioning to their usual capacity. These tasks will maintain the beauty of this delicate white marble building and guarantee its splendor for many years to come.